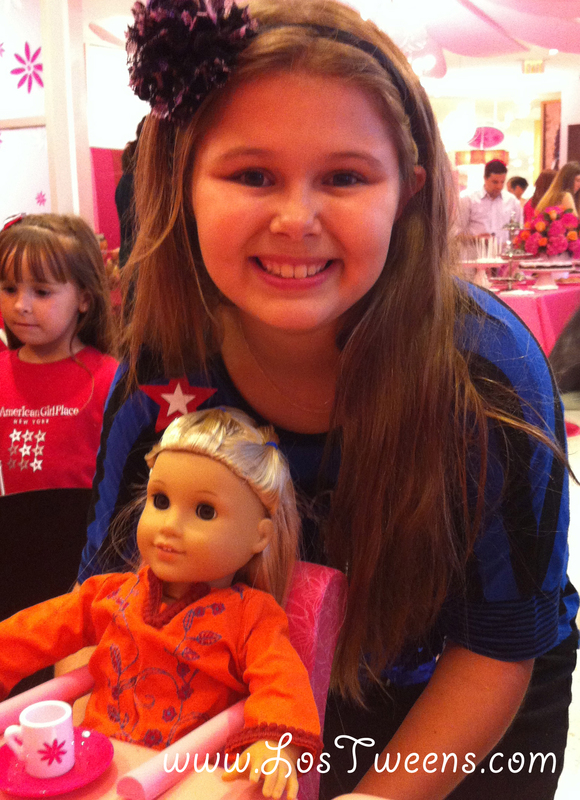 Just in time for Christmas, read below for the American Girl Doll giveaway! One of my daughters enjoying tea time with her American Girl doll in the Miami store. Maybe you think ‘tweens’ and then ‘American Girl’ and wonder if they’re too old for the dolls? More importantly, what I love about the brand is its focus on providing opportunities for girls to be informed, intelligent, engaged in their ideas and literature that helps them explore the many challenges that accompany a growing girl. If you haven’t visited an American Girl store, let me tell you it’s a wonderful experience where the dolls and the girls- are the centers of attention. If a girl visits without her doll- no worries- they have ‘loaner dolls’ available and they’re complete with special chairs so they can sit right at the table in the adorable Bistro. For tweens in particular, the book selections help them navigate their body changes, bullying scenarios, managing their friends, difficult relationships and more. The books are written in a simple format that allows them to easily interpret the material. At times the cost of the items can be on the high side. Helping your daughter create financial goals and ‘save up’ for her dolls, accessories, clothes and more can be a great way to reward them. The quality certainly does back up the cost as the dolls stand up to ‘mucho amor’ from the girls! The key fact is that we’re still helping girls enjoy innocent fun while helping them achieve financial goals. Grace, the 2015 Girl of the Year, is an avid baker with an entrepreneurial spirit. In her story, Grace is motivated to open her own French baking business after an inspiring trip to Paris. 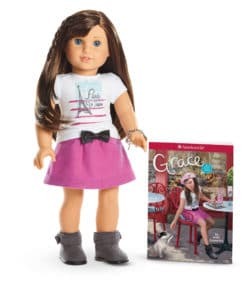 The Grace doll is 18” tall with sparkling blue eyes, freckles, and long dark-brown hair. Grace arrives in a white top with a sparkly Paris graphic, a pink skirt with a black bow on the front, and a charm bracelet. Includes gray ankle boots and pink underwear, plus the Grace paperback book, written by Mary Casanova. Enter below to win “Grace”! This entry was posted in Product Reviews, Raising Tweens, Videos and tagged American Girl, doll, gift teens, giveaway, tween girls. Bookmark the permalink. No, I haven’t try those styles, but I will try them soon. Thanks for the opportunuity. I have not, but I really love the soft curls! I have never tried one of the wands before, but the video makes it look so easy and so beautiful! Like I said above. I haven’t, but my daughter died her hair tips in a beautiful blue. It will wash off, but it looks so pretty. Grace is so cute! I loved the American Girls when I was growing up.